Part of my Women Writing in Digital Spaces course, this project asked students to edit and create new articles in Wikipedia to increase representation of women and LGBTQ identities and issues. Students selected articles based on need for coverage and representation, learned Wikipedia conventions of writing, researched, then created or added content to these selections. 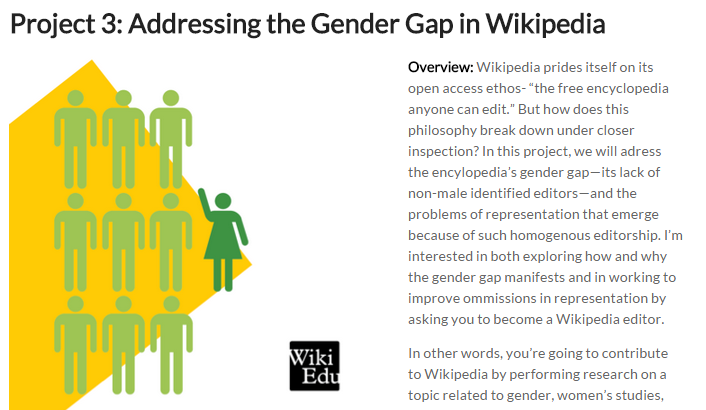 Wikipedia’s Gender Gap and What We’re Doing About It (Part I). Digital Rhetoric Collaborative. University of Michigan Press/University of Michigan Center for Writing. December 3, 2014. Wikipedia’s Gender Gap and What We’re Doing About It (Part II). Digital Rhetoric Collaborative. University of Michigan Press/University of Michigan Center for Writing. April 29, 2015.